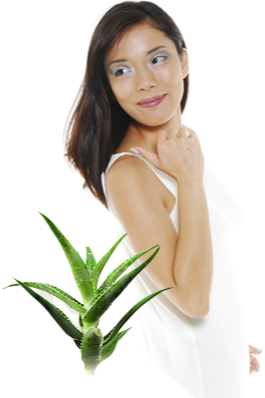 The essential amino acids in aloe vera resemble the human body more than any other known plant. It contains 19 of the 22 amino acids that our body requires, eight of which are essential and can not synthesize for ourselves, we need the aid of external sources. It provides us health and dental hygiene in both teeth and gums. With its use we get a daily dose of vitamins A, B1, B2, B6, B12, C and E, Folic Acid and Niacin. The human body cannot store some of these vitamins, so we need to incorporate them into our regular diet. It helps us get the daily dosage of minerals we need, including calcium, sodium, iron, potassium, chromium, magnesium, manganese, copper, and zinc. Recuperates the collagen and elastin, since it adds an immediate supply of basic components to produce and maintain healthy skin. Skin regenerates every 21 to 28 days, a daily allowance of aloe vera provides the skin with freshness and keeps it in good shape. It contributes to the relief of burns, cuts, scrapes and other skin irritations. Provides natural support for the body's immune system. Its anti-inflammatory properties are able to inhibit inflammation without side effects, and aids in proper muscle and joint mobility. Taking aloe vera frequently, helps to cleanse the digestive system in a natural manner, it produces a well being feeling, increases energy and regulates weight. By consuming aloe vera we obtain a digestive system in perfect working order, which ensures better nutrients assimilation, and reduces harmful bacteria and fermentation.